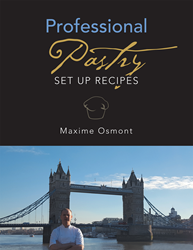 The head pastry chef at London’s famous The Mondrian Hotel, Maxime Osmont, has released his debut recipe book, “Professional Pastry: Set up Recipes.” Created for professional pastry chefs and bakers, the book provides recipes and techniques utilizing brand new materials not found anywhere else. The solid and authentic recipes, all created by Osmont, will help chefs and bakers be more creative in their work. Born and raised in France, Osmont was destined to be a professional pastry chef as he was raised in a proper old fashion bakery with a wood oven. A graduate of the Institute National de la Boulangerie Patisserie in Rouen, France, Osmont now has over 16-years of professional baking experience. He has worked at several Michelin star restaurants including L'Atelier de Joël Robuchon in London and Le Saint-Paul restaurant in France. Maxime Osmont left France at 21 years old to travel and see the world and created a collection of recipes from every place he has worked. He is now a Head Pastry Chef in London and every day is about mixing up all the knowledge he accumulated during those years of practice and being creative with recipes. He completed his pastry and bakery apprenticeship in Rouen, Normandy, France. His grandfather’s bakery taught him how to appreciate “le bon pain” and gave him all the strength necessary to keep going into his career. Osmont currently resides in London.